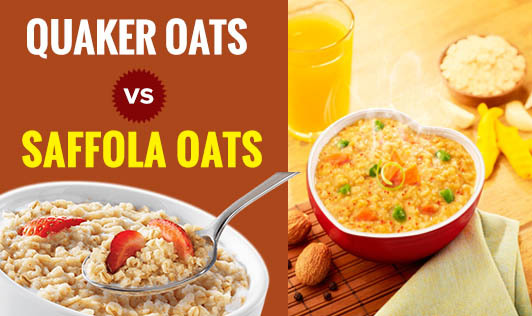 Oats is known to be a super food for weight watchers! It is one of the common choices of breakfast cereal among the urban population. With so many brands sprouting up, as a consumer, it becomes difficult to select a genuine product. While some brands use freebies to promote their product, some others use discounts for their sales. This just makes it all the more confusing! Let us narrow it down to two popular brands in India. Quaker oats and Saffola oats, Quaker oats is a product of PepsiCo while Saffola oats is a product of Marico limited. Both these brands have come up with some interesting flavors to increase the acceptance among consumers. They come in small pouches with a controlled portion size that is easy to make. When you compare the values of major nutrients like energy, protein, dietary fiber and soluble fiber in 40 gm of uncooked oats, it is more or less the same in both the products. And yes, as oats is a plant product, it has no cholesterol. With respect to pricing, Quaker oats comes at a price of Rs 140 per kg, while Saffola is at a price of Rs 150 per kg. The main highlight of Saffola oats is that it comes with a recipe book. It gives some good recipe ideas to make the boring breakfast cereal interesting and healthy by incorporating this wonderful cereal in our everyday meals. With constant promotions, we all know that oats has a special nutrient in it called beta-glucan which is a soluble fiber that is good for your heart that especially reduces the bad cholesterol in blood. So, the brand here doesn't matter when the choice is between these two. Both Quaker and Saffola are equally good. Saffola comes with a recipe book that could give you some ideas to make oats interesting! Which one would you buy?